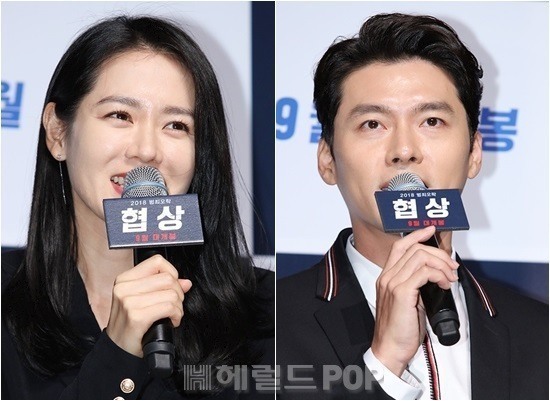 Actor Hyun Bin and his recent movie co-star, Son Ye-jin, have both denied rumors that they are romantically involved, according to their agencies, after a suspected photo of them shopping together began to circulate on the Internet. Both of their agencies said they met in the United States for a get-together with their friends and they are not dating. "They are close and as far as we know they just met for a catch-up," Hyun's VAST Entertainment agency told Yonhap. Son's agency, MS Team Entertainment, issued a similar statement. "They hung out with their friends in a group and they were with friends at the grocery store. They are not dating," her agency official said. Rumors about the two dating reignited after a photo of them went viral on the Internet on Monday. In the picture, Hyun and Son, wearing black caps and sunglasses, were supposedly shopping for groceries at a supermarket outside of Korea. Earlier this month, the two were caught up in dating rumors and both agencies have denied the rumors.